Hipstamatic’s IncrediBooth iPhone, iPod Touch, and iPad app brings fun, exciting photo booth effects to your bag of iOS photography tricks. For just $.99, you and your friends can shoot photo booth style prints without the dreaded task of actually finding a photo booth and waiting in line. The IncrediBooth in-app camera is simple, intuitive, and functions beautifully. There is a rectangle in the upper portion of the screen with a guide to help you establish eye level. You can turn the camera on yourself with a touch, or you can photograph others with a touch. There is a red button surrounded by the numbers 1, 2, 3, and 4. When you touch the red button, beeping starts and photos start snapping in just a couple of seconds. Your four photo strip is instantly processed and available at the frame icon. 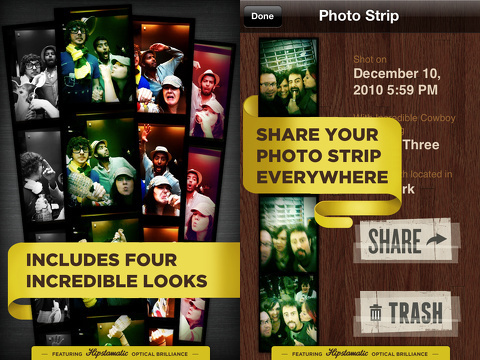 Your photo strip is marked with the time and location of photos and the type of film used. You can share to Facebook, Twitter, and email with one touch, or you can save it to your iOS device’s library. The arrow icon on the camera interface takes you back to the IncrediBooth store to buy photo booth packages and upgrades for $.99 each. 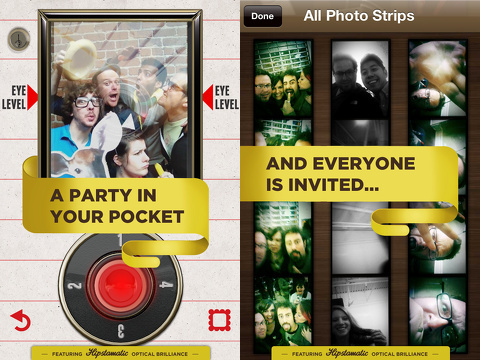 You can apply the in-app effect purchases to further enhance your IncrediBooth iPhone app photo strips. The default photo booth is a black and white effect that is interesting and appealing, but it wouldn’t be unreasonable to expect at least 3 photo effects for the initial download price. The in-app purchases are standard practice for Hipstamatic fans, but it is disappointing to have so few for experimentation. Despite the need to make $.99 in-app purchases to enhance functionality, the IncrediBooth iPhone app is certainly a cool way to capture fantastic moments with friends and family. AppSafari review of IncrediBooth was written by Jenni Ward on August 15th, 2012 and categorized under App Store, iPad apps, Photos, Universal. Page viewed 4704 times, 2 so far today. Need help on using these apps? Please read the Help Page.